Chocolate pecan pie poppin’. 🙂 Another dessert on a stick, but I love how adorable pops look. This was a last minute present I threw together that I hope the birthday gal will enjoy. I’m crossing my fingers that they make the journey from Texas to California as pops and not crumbs. I used a combination of recipes and tips from Cocina Marie, Blooming Foodie, South by San Francisco, and Bakerella to make Chocolate Pecan Pie Pops. First, make the pecan pie filling. Preheat oven to 350º F. Mix together the eggs, brown sugar, honey, vanilla extract, and melted butter in a large bowl. Stir in the pecans. Pour the mixture into a lightly greased pan. Bake for 30 minutes (to stiffen the filling before adding them to the pops). Pour filling into a bowl and allow to cool 15-20 minutes. While the filling is baking, take out the pie crust and let it come to room temperature. Lightly flour your work surface. Gently unroll the pie crust onto your work surface. Lightly flour the pie crust and flip it over. Using a rolling pin, smooth out the pie crust. With a cookie cutter or glass (mine had a 2.25 inch diameter), cut out circles from the pie crust. You can re-roll the extra crust to cut additional circles. I was able to get 30 circles from the two pie crusts without re-rolling them. Place one layer of circles onto a baking sheet leaving room for the lollipop sticks (optional: cover baking sheet with parchment paper). Make the circles a little bigger by rolling the rolling pin over them a couple times (this makes it easier to add the top half). Using a brush or spoon, brush egg white on the top of each circle. Push a lollipop stick into each circle. Refrigerate for a few minutes. 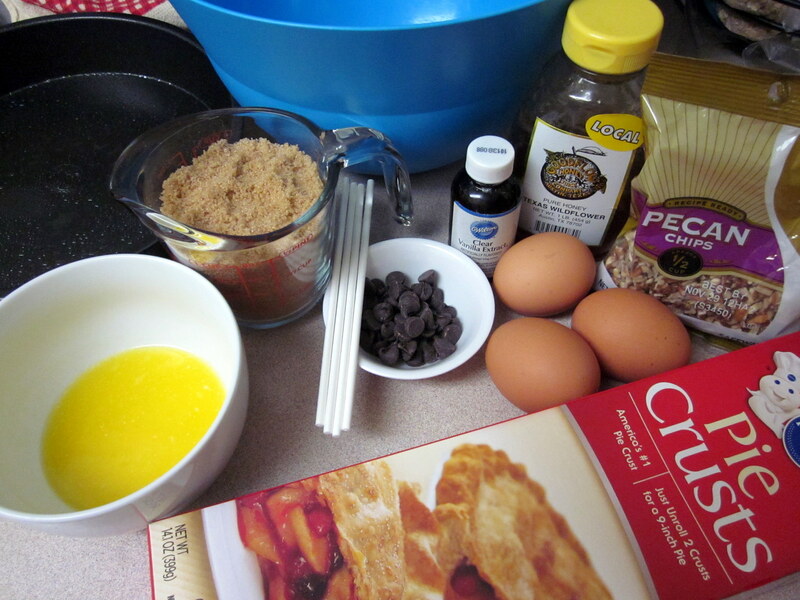 Add a teaspoon of pecan pie filling to the middle of each circle. Add two chocolate chips (I added four and it overwhelmed the pecan flavor a bit). Lay another circle of crust onto each pop. 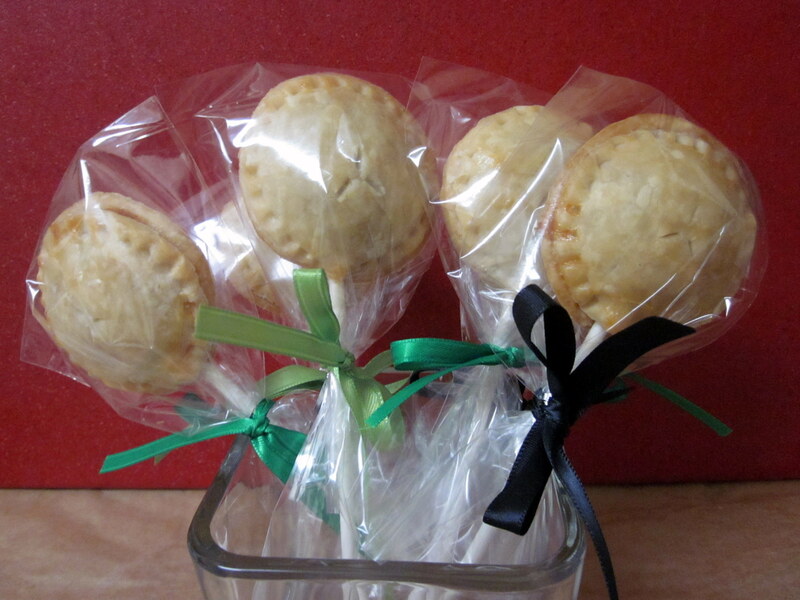 Seal the pie pop using a shortened piece of a lollipop stick or a fork. Be sure to carefully push the crust around the lollipop stick so that it doesn’t fall off. Cut three slits into the top of each pop to allow it to breathe while baking. Refrigerate for a few minutes to help them set. Brush the top of each pop with egg white. Bake for 15 minutes or until lightly brown. Allow to cool in pan before moving them. My first batch turned out prettier than my second. I think I got a bit too excited with the filling on the second time around. This took me about three hours to make from gathering the ingredients/supplies to wrapping them up, not including cooling time. I made 15 pops with this recipe but had a lot of leftover pie filling. I imagine that with another box of pie crust, you could make two to three dozen pops. 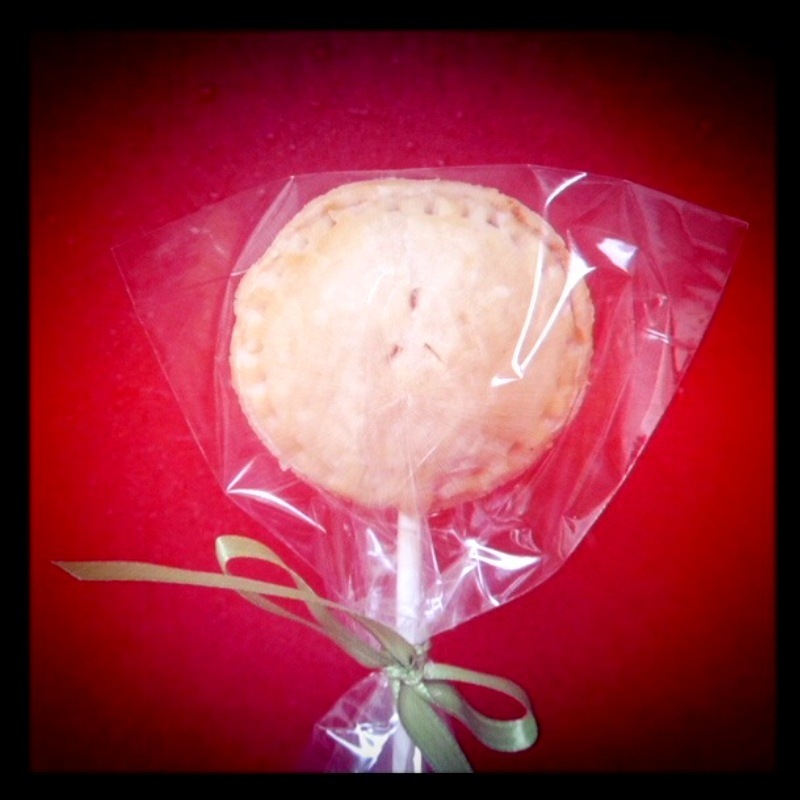 This entry was posted in Birthdays, Food, Gifts and tagged Chocolate Pecan Pie, Pie Pops. Bookmark the permalink. very cute… they look time consuming! Bravo to you! thanks nellie! i appreciate your support! I must say they were scrumptious!!! And oh so cute!!!! Most of them made the trip safely, luckily only one or two fell apart. P.S. Yay for being part of the blog! 🙂 thanks again!! Oui Oui Mademoiselle! These deserts looook soo delicious. Tre bon!!!! I’m experimenting with your recipe this weekend so I can make about 95 of these for my southern wedding. They’ll be perfect favors! I hope they turn out the way you want! You can also use corn syrup instead of honey in the pecan pie filling, depending on what you have on hand. Good luck and congrats on the wedding!